Michael Bibby was born on the 13th May 1978, in Cherry Hill, New Jersey, USA, and is best known for being a former professional basketball player, who played in the position of point guard in the National Basketball Association (NBA), for the Vancouver Grizzlies, Atlanta Hawks, Miami Heat, and other teams. His professional playing career was active from 1998 to 2012. Currently, he works as an assistant basketball coach. So, have you ever wondered how rich Mike Bibby is? It is estimated by sources that Mike counts his net worth at the impressive amount of $60 million, as of mid- 2016, which has been accumulated through his successful involvement in the sports industry not only as a professional NBA player, but also as a coach. 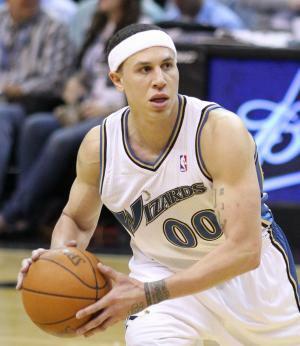 Mike Bibby was raised with two siblings by his mother, Virginia Bibby, and his father, Henry Bibby, who is was widely known himself as a former professional NBA player, particularly for the Philadelphia 76ers. Mike matriculated from Shadow Mountain High School in Phoenix, Arizona, and then enrolled at the University of Arizona, where he distinguished himself as a basketball player. In his freshman year, Mike led the college to the NCAA championship, and he was named Pac-10 Freshman of the Year. Next year he was named Pac- 10 Player of the Year, and he earned First-Team All-America honors. In no time, his professional playing career began, when he was selected as the second overall pick by the Vancouver Grizzlies in the 1998 NBA Draft, and signed a rookie contract, which marked the beginning of an increase of his net worth. He stayed with the Grizzlies until 2001, when he was traded to the Sacramento Kings, alongside Brent Price, in exchange for Jason Williams and Nick Anderson. During his time at the Grizzlies, Mike averaged around 15 points and 6 assists per game. In Sacramento, his numbers improved, and also his net worth as he signed a contract worth $80.5 million over seven years. However, after the 2004 season, he became prone to injuries and missed a number of games, but still helped the team by averaging around 20 points per game, with 6 assists to his name as well. In 2008 he moved to the Atlanta Hawks, after a trade in which Shelden Williams, Anthony Johnson, Tyron Lue, and Lorenzen Wright moved in Sacramento, and also Sacramento acquired rights for a 2008 second-round draft pick. He stayed in Atlanta until 2011, signing a contract worth $18 million over four years in 2009, which further increased his net worth. However, his injuries contributed to his numbers decline, and he averaged only around 15 points, but still helped the Atlanta reach the play-offs, but without any major success. In 2011, he became a part of the Washington Wizards in a trade that included Jordan Crawford and Maurice Evans from the Atlanta, and Kirk Hinrich and Hilton Armstrong from the Wizards. However, Mike bought out his contract, and joined the Miami Heat in March of the 2010-2011 season, and reached NBA finals with the Heat, however, they lost to the Dallas Mavericks. After the season ended, he signed a contract with the New York Knicks, which also added to his net worth, but at the end of the season he announced his retirement. Most recently he has become an assistant basketball coach at his alma mater Shadow Mountain High School, in 2013, increasing further the overall size of his net worth. Regarding his personal life, Mike Bibby is married to Darcy Watkins, with whom he has three daughters and a son.